What Are the Best Weed Removal Tools for Your Garden? Weeding probably isn’t anyone’s favorite part of gardening, but it does have to get done. The problem with weeding is when you use your hands you can get a very sore back and hands. But, most of your regular gardening tools won’t really accomplish the same job, so what is the alternative? There are a lot of weed removal tools available, but are they any good? I wanted to take some time and talk about these tools to help you choose the best weed removal tool for your garden. Then, you can take a look at some of the tool that I think could be a good asset for you in your own yard. There are many different types of weed removal tools. You can find shorter tools able to do more fine maneuvering, tall tools for general weeding without stressing your back, and many tools made specifically for certain types of weeds. Dandelion weed removers are some of the most commonly found specialty weeding tools, so if you have an abundance of dandelions you can easily find the right tool to get rid of them. To be clear, we won’t be covering the chemical, fire, or other weed removal tools, and will be exclusively covering manual tools that won’t cause as much of a hazard to your yard. Here are some of the things you should look for when you’re choosing your weed removal tool. Make sure that you think about what will be best for your needs specifically and not just what is popular. Flimsy, poorly built equipment is not useful for weeding. You need a tool that is going to last you for years rather than breaking after a few uses. Look for something that’s built to last and put together well. Because there are so many different types of weeding tools, you should pay attention to what kind you’re buying. Which weeds are you dealing with the most? Do you have a lot of different kinds or a few specific weeds that you remove on a regular basis? Most weeding tools designed for certain weeds will also work for other weeds, but they won’t always be effective. As an example, a weeding tool made for removing crab grass will also be able to remove weeds with long taproots, but you may have to work harder to get it done. Weeding tools should last a long time, so it can be worth it to spend a little extra on them. However, price does not equal quality. Buying cheap tools can result in you spending a lot more because you have to buy them again and again, but if you buy an expensive tool that’s not effective or isn’t built well you could be wasting money as well. Set a budget based on some of the average prices so that you can select the best weed removal tool without spending too much money on it. Keep in mind that the long-handled weeding tools will usually cost more than short-handled tools. Generally, the only maintenance required for a weeding tool is cleaning the dirt and grass off after each use. However, some of the more advanced tools need a little extra care. You may need to oil joint in some of the long-handled weed pullers or store some weeding tools in special areas to prevent rusting. The purpose of a weed removal tool is to make the job easier for you. If you end up getting a tool that makes the job more difficult or doesn’t help you very much than you will become frustrated with it. Look for a tool that is going to make things easier for you. To do this, think about what your biggest problem is with weeding your garden. Are you most bothered by back aches from all the bending and pulling? Choose a long-handled weed puller. Do you have using a glove or your bare hands to twist weeds out of the ground? Find a short-handled twist and pull type of weed removal tool. Choosing the best weed removal tool for your garden doesn’t have to be tricky. You just have to think about what it is that you need and choose a tool that best matches your needs. Below are a few reviews of some of my favorite weed removal tools. This is a fairly popular weed remover for gardeners and casual lawn-maintainers. Using this long-handled weeding tool is as easy as shoving the claws around the weed base, clamping down, and pulling the weed out of the ground. Those actions are done with your feet, so you won’t have to bend over at all when you’re using this device. The 4 claws at the bottom of the weed remover are designed to cut the weeds and pull them out of the grounds with their roots. When the claws clamp down, they will grab hold of the plant. Once you pull the weed out, you can release the clamps and throw the weed into your discard pile. Fiskars has designed an ergonomic handle that is easy to hold and use. It is 39 inches tall, making it ideal for most people. This weed remover is great for dandelions, thistles, and other weeds. For general-purpose weeding, this is a great tool. If you live in an area with hard soil, you might not be able to use this right, but most people can get great use from it. It is worth it for anyone who wants to weed their lawn or large garden, because it makes the job quick and easy even in large areas. If you need a good general-purpose hand-held weed remover, the Nejiri Gama Hoe is a great choice. This is a fairly small, ergonomically designed weeding tool with a small blade. The blade can be used for shallowing digging, cutting woody roots, and pulling up the roots of many different types of weeds around your yard. As far as being durable, this is a strong tool that is well-made and built to last. If you want to buy one of these, you won’t have to buy one again every year. The blade is made from hardened steel and it has a wooden handle for added comfort. This is a great weed remover for anyone who want to be able to get weeds from anywhere around the garden without much trouble. It works well in tight spaces and wide open lawns alike. Unless you have a lot of heavy-duty weeds to pull, the Nejiri Gama Hoe should work well for you. It’s designed to fit most of the needs of the average weeding gardener and does well to fulfill that mission. If you’re a landscaper or someone looking for a heavy-duty cutting weeder, this may not be the right tool for you. 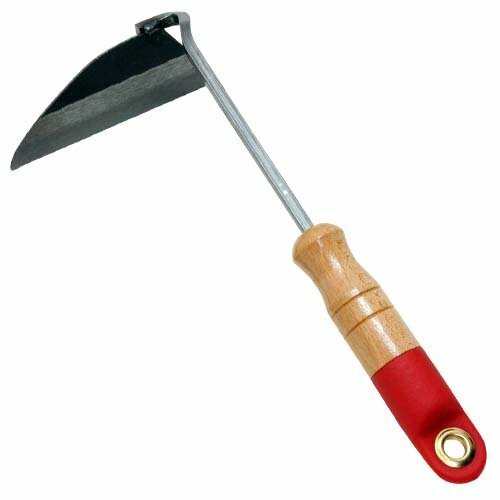 This hand-held weeder is great for weeding in a small or medium sized garden. It has a curved shaft made from rust-proof aluminum. There are two points on the end that help the tool to dig into the ground and get down to the roots of most weeds. It might be more difficult to use in very hard ground, but it works very well in most soil types. The handle on this tool is very comfortable, so you can use it for hours without feeling a lot of discomfort in your hands. It is also a durable tool that’s made of one solid metal piece. This design keeps it from breaking when you use it for a long time. 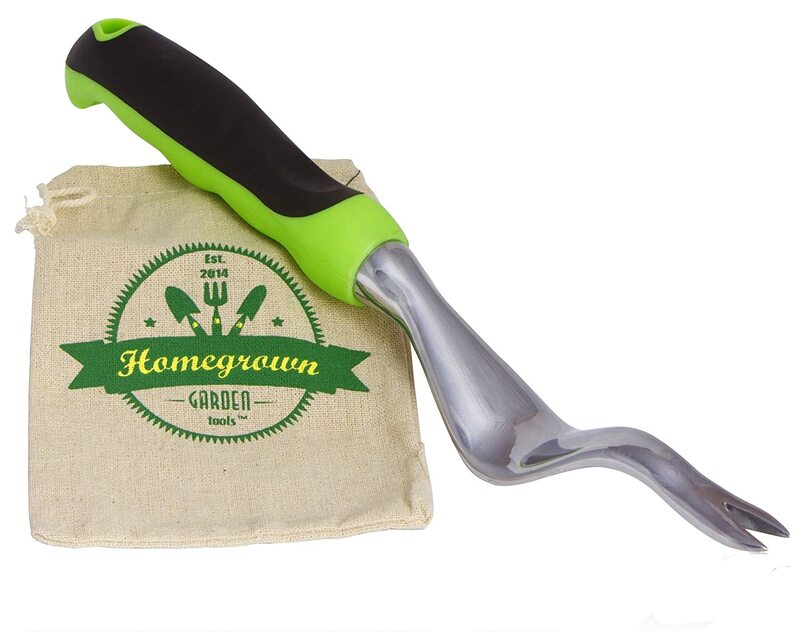 When you’re weeding with this tool you will be digging at the weed and then twisting and turning the tool to pull the weed and root out of the ground. Its design is ideal for this type of use, and it’s easy to pull out any weeds that you can find and dig. A simple hand-held tool, designed for pull and twist weed removal. You can get a lot of use from this weeder in most gardens. It may not be great if you want to weed a large garden or a large lawn frequently, but it’s good for most people’s everyday use. The Garden Weasel Weed Popper is simple to use and easy on the back and knees. All you do is place the device over the weed, push it down with your feet, and twist the handle. This will pull up the entire weed, roots and all. Because this tool takes out a small plug from the ground, you can actually use it to aerate as well. If you don’t want aerated holes in the ground, you should take a little bit of extra soil around with you to fill up the holes after you remove a large weed. Be aware that this is not a device for taking out large weeds. The blades are a bit too small to effectively remove weeds with deep roots or a large width, but it is very good at pulling smaller garden and lawn weeds. You may not like the holes left after you pull out a weed, but if all you’re looking for is a good tool that you can use without bending at all than the Garden Weasel is a good tool for you. The tool isn’t great for large or woody weeds, but most of the garden weeds you have can be removed, such as dandelions and thistles. Long-handled weed pullers are the best weed removal tool choice for anyone who has arthritis, back pain, or knee pain. This dandelion weeder can be used for a lot more than just dandelions. It has a sharp V-shaped blade on the end that digs out weeds from the ground. You can dig fairly deeply to get weeds with large roots. Using this weed removal tool is simple and doesn’t take much effort. All you have to do is dig around the root of the weed, stick the blade into or around the root, and pull it up. Digging up all sorts of weeds is possible, except thick, woody weeds may be difficult to remove. This is not a pry bar and shouldn’t be used that way. It is a digging instrument that’s best for digging around the weed and pulling it out that way. If you’re looking for a long-handled weeding tool that can take out a lot of weeds with thick roots, this is a good tool for you. It’s great for anyone that wants to avoid bending over a lot. Hopefully now you understand a lot more about the types of weeders available and what might be the best weed removal tool for you. Check out the weed removal tool reviews above and see if any of our recommended choices will work for you! If you have any questions or would like to add anything, let me know in the comments!